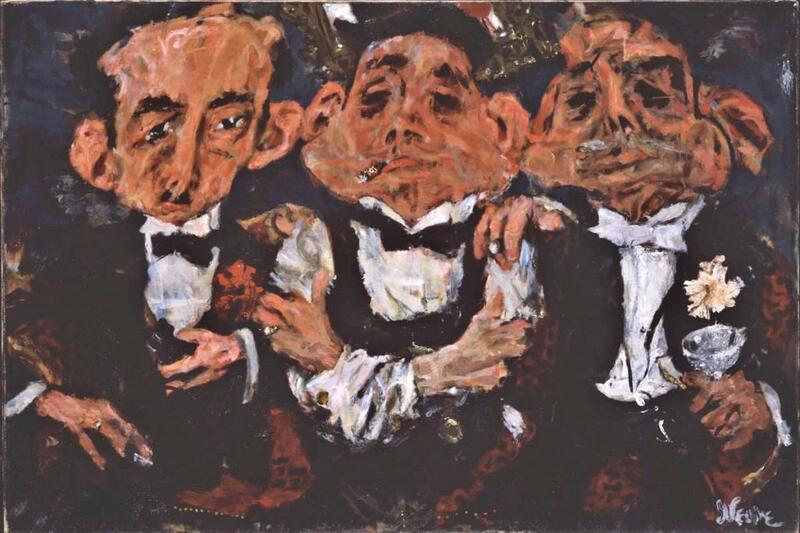 One of the most important American artists of the twentieth century, Jack Levine imparted a wry and penetrating social commentary to his work that deftly skewers the rich and powerful, as well as all those whom he encountered who were inflated by pretension or hypocrisy. He developed a highly individualized modernist approach, an expressive mode of painting that he used to critique injustice and dishonesty in American society. He also explored classical and biblical themes with an updated sensibility that demonstrated his lifelong study of art history and his mastery of Western painting traditions. Throughout his long career, he remained committed to figurative art, disregarding trends in the art world that did not suit his purposes. This was particularly true in the 1950s, when abstraction was in ascendance and social content was deemed out of fashion by leading writers and critics. Levine died on November 8 after a short illness, according to his son-in-law Leonard Fisher. Born January 3, 1915, the youngest of eight children of Lithuanian immigrant parents, Levine grew up in Boston’s South End. From 1929, when he was fourteen years old, until 1933, he studied painting with Denman Ross in the Art Department at Harvard University. He was then employed intermittently by the Works Progress Administration’s Federal Art Project from 1935 to 1940. Two of his WPA paintings, Card Game (1933) and Brain Trust (1935), were included in an exhibition, New Horizons in American Art, at the Museum of Modern Art in New York in 1936. The following year, he achieved national recognition when his painting, The Feast of Pure Reason (1937), a scathing critique of political and police corruption, entered the collection of the Museum of Modern Art. 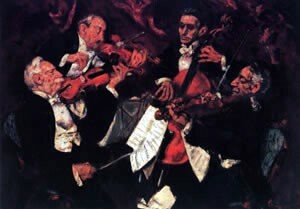 Another of his paintings, String Quartet (1934-37), was included in the Whitney Museum of American Art Annual for the first time that year. Confirming his rapid rise in the art world, he joined Edith Halpert’s prestigious Downtown Gallery in 1939, at age twenty-four. Levine’s burgeoning career was interrupted by a three and a half years in the Army during World War II. Even so, he gained widespread public notice while serving in the South Atlantic in 1942 when String Quartet was acquired by the Metropolitan Museum of Art, after being included in its exhibition, Artists for Victory. The image was later reproduced and displayed in New York City subway cars. After the war, Levine married artist Ruth Gikow and moved to New York. Earlier in the 1940s, Levine had begun working on paintings with Old Testament themes, resulting in a series of Hebrew Kings and Sages that revealed a gentler, more contemplative side of his nature. 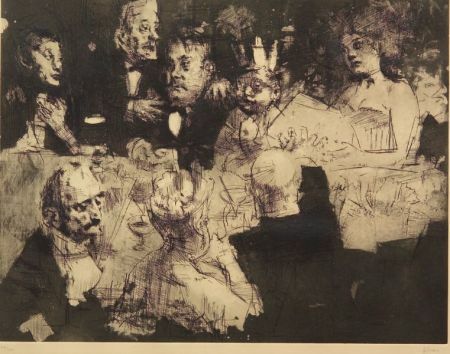 At the same time, he continued creating controversy with paintings like Welcome Home (1946), a satirical take on a society banquet honoring a returning general, which was acquired by the Brooklyn Museum. This painting, when it was later shown in a State Department exhibition of American art that traveled to Moscow, created an international controversy with its wry look at patriotism and the military hierarchy. Levine, along with several other artists, was subpoenaed to appear before the House Un-American Activities Committee, though in the end he did not appear as he was traveling in Spain with his family. In 1952, the Institute of Contemporary Art, Boston, organized a major exhibition of his work that traveled widely, closing at the Whitney Museum of American Art three years later. 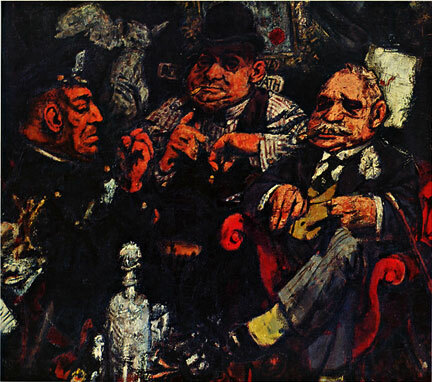 Throughout the 1950s and 1960s, Levine continued to create some of his finest works, including what is often regarded as his masterpiece, Gangster Funeral (1952-53), which was acquired by the Whitney Museum. 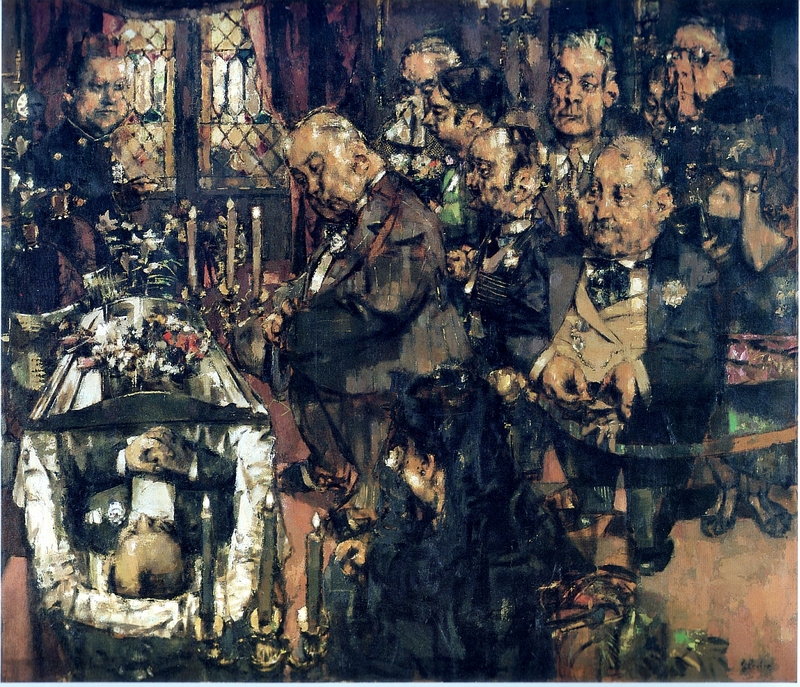 Other important paintings that indicate the range of his interests include Election Night (1954), The Three Graces (1959), Birmingham ’63 (1963), and The Judgment of Paris (1964). In the early 1960s, Levine also began creating prints on a sustained basis for the first time in his career. Overall, he created more than eighty editions that capture the imagery of his paintings in engravings, etchings, and lithographs. In 1979, a comprehensive retrospective of his work that was organized by the Jewish Museum traveled around the country. 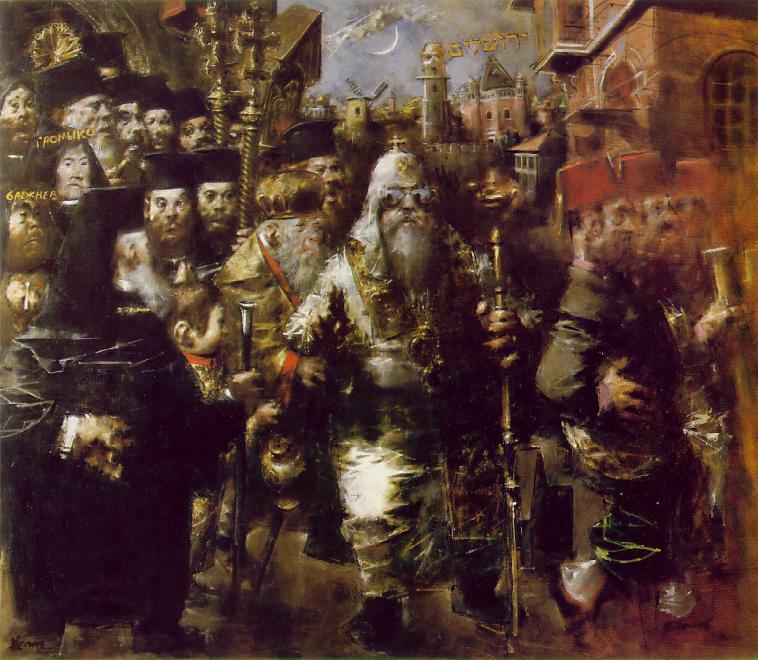 A visit to Jerusalem earlier in the decade inspired a series of paintings, culminating in The Patriarch of Moscow on a Visit to Jerusalem (1975). Levine continued to work steadily through the 1980s and 1990s, creating notable paintings like Orpheus in Vegas (1984), The Finding in Moses (1993-95), and Runway (1999). Then, in 1999, the Brooklyn Museum held a retrospective exhibition of his etchings and lithographs. His most recent exhibitions are Jack Levine at 90, held at DC Moore Gallery in New York City in 2005 and an exhibition at DC Moore Gallery this past January celebrating the artist's 95th birthday. The gallery has represented Mr. Levine's work since 1995. Besides several major monographs and exhibition catalogues, Levine has been the subject of three documentary films: Jack Levine by Zina Voynow, Peter Robinson, and Herman J. Engel, 1963, produced by Zina Voynow; Jack Levine: A Feast of Pure Reason, produced and directed by David Sutherland in 1985; and Jack Levine: An Autobiography on Film by William Powers, which appeared in 2005. During the course of his career, Levine received many awards and honors, including a John Simon Guggenheim Memorial Fellowship in 1945 and a Fulbright grant to study in Italy in 1950. He became a Fellow of the American Academy of Arts and Sciences, Boston, in 1955, and was elected to the American Academy of Arts and Letters, New York, in 1973.